Ms Saradha (aged 48) has been working for 25 years as a field worker in the nursery for rubber trees on the New Ambadi Estate. Her husband, Sardar Shiva, has mental health problems, which is why she has to provide for her family on her own. Her daughter, Sandhia, is 21 years of age and married, while her son Samil is doing well in his studies to become an electrical engineer. The family are living in a small brick house, which consists of three rooms, to which has been added a lean-to shed made from planks and a plastic roof, which houses the kitchen. The living quarters have electricity, but water has to be drawn from a neighbour's well. The family is the proud owner of one cow and three goats. In January 2009 Ms Saradha needed to undergo an operation, for which the official health insurance only paid Rs 4000 out of the total sum of Rs 7000. The joint body agreed to make up the difference using the Fair Trade premium fund. Happily, Ms Saradha has made a complete recovery following her operation. Mr Dadmanabhan (aged 58) has also benefited from the Fair Trade fund. 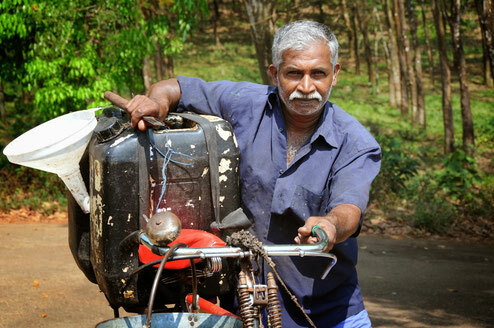 He has been working as a rubber tapper for 38 years. He has two sons (aged 25 and 23 years respectively) and one daughter (aged 28). The younger son, Mahesh, who had trained to become a driver, had just received his licence and was looking for work, when one day his motorcycle hit a pothole and he was flung onto the side of the road. Furthermore, his motorcycle landed on top of him, and he suffered a broken hip. To make matters worse the health insurance, which his parents had, only covered children up to the age of 19. The costs of having the hip fixed amounted to Rs. 200.000, and even nine months later, Mahesh still has a pronounced limp. He is also still looking for work. The Fair Trade premium fund at least helped keep the financial damage within limits by providing Rs. 100.000 in support, which were particularly helpful in the first stages of emergency medical support.